I know nothing about Reggie Jackson except that he’s a retired baseball player and his agent has the good sense to attach Jackson’s name to solid products. 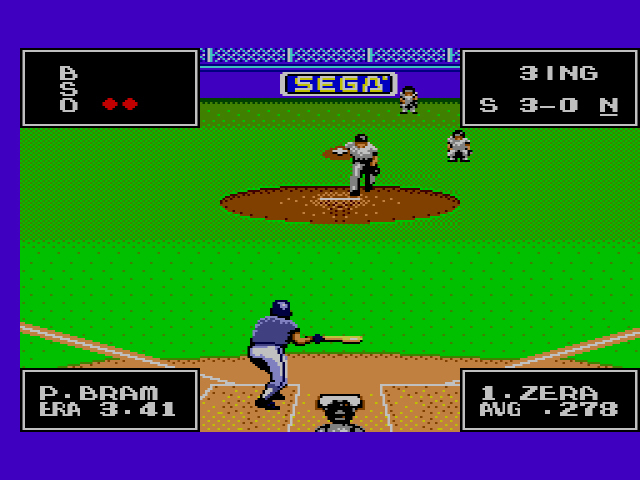 Reggie Jackson Baseball (otherwise known as American Baseball in Europe – sorry Reggie) is one of those products, perhaps the finest baseball game Sega developed for the Master System. For those of us who could care less about baseball – myself included, for the most part – what makes the game stand out above the horde of all-too-similar base and ball titles? Slick controls, a variety of options, and goofy touches that really tie the field together. Pitching, batting, and fielding feel close to seamless. Press button 2 and a direction on the D-Pad, and they’ll shift both the direction of your pitch or the potential angle of your hit ball. The in-fielders are a little dull. They’ll often crowd around a ball, making it difficult to tell who should pick it up and throw. The out-fielders moves are spot-on, due to the option for automatic fielding (every baseball game should have this). Except for the occasional touch of slowdown, every move is swiftly executed. Thanks to the fantastic camera that consistently follows the ball, you’re able to keep up with the game’s quick pace. Options include Exhibition Game, a one game match for one-to-two players; Tournament Mode, a series of games that concludes with the World Series (sadly, only one-player); Watch Game. where you watch the computer play a game; and a Home Run Contest, in which you try to hit as many home runs as you can. The Exhibition Game is for us folks who like to dip our toes in the sandy, sweaty sea of baseball. The rest are for the die-hards, those who worship at the shrine of peanuts and Cracker Jacks. The legit MLB teams are here too: New York Yankees, Chicago Cubs, Los Angeles Dodgers, Rockford Peaches, etc. Because of my lack of knowledge about baseball players, I’m not sure if any of the players are from the ’87-’88 season or not. Obviously Mr. Jackson was, but he was presumably paid a lot of money to be there. Who knows about the rest of them. 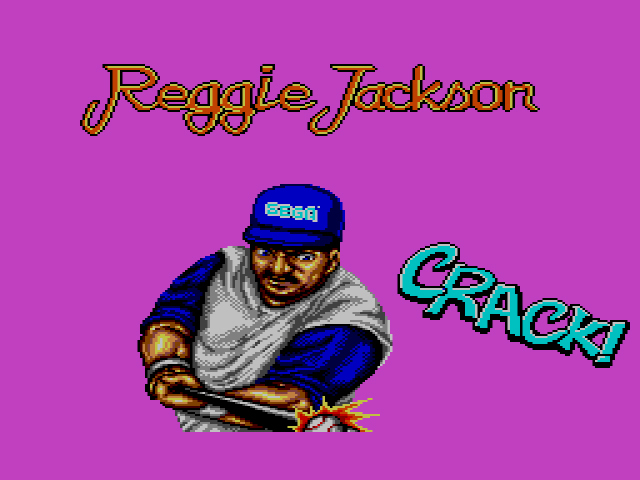 Sega didn’t release Reggie Jackson Baseball in Japan, but that didn’t stop them from placing the occasional bizarre “thing that should not be.” The billboard signs shown between innings display a hint of freakiness, such as an obvious male model drinking a can of soda and winking at you. A nod to ads at the ballpark, sure, but still creepy. Also, if the pitcher hits the batter with a ball, all the players will fight in a massive hullabaloo, while the batter is carried away on a stretcher during the fighting. 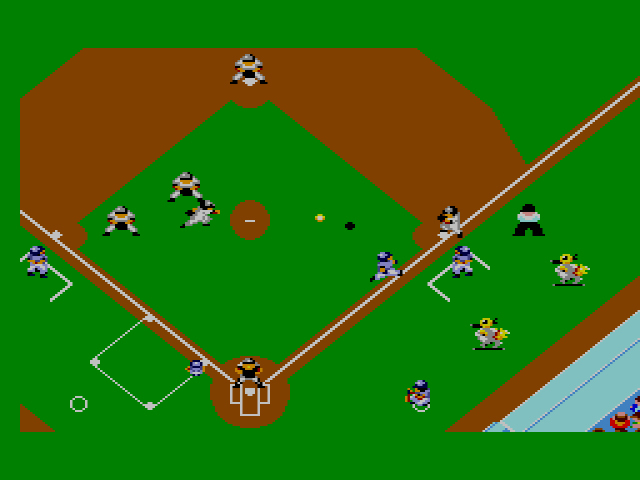 Then, as if nothing ever happened, the batter is magically at first base and the game continues as normal. 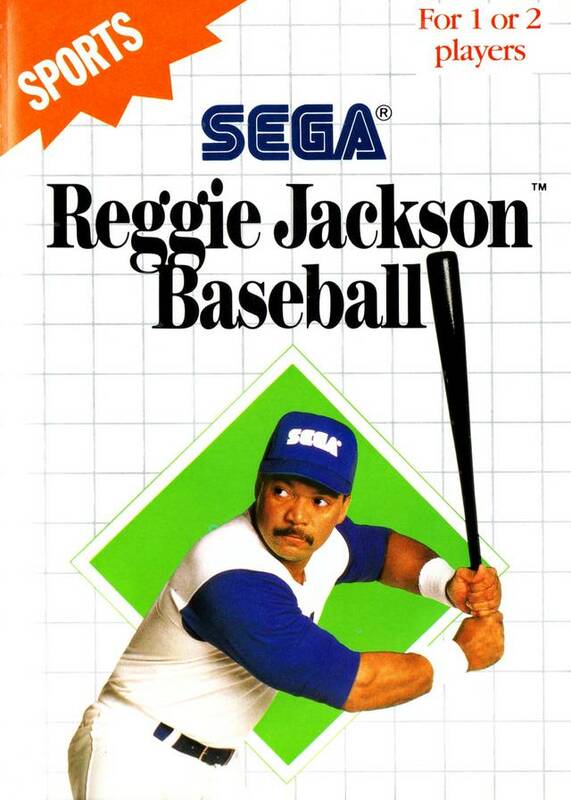 Despite Sega’s insistence that their previous Master System baseball games were “great,” Reggie Jackson Baseball is the first they’ve developed that comes close to claiming that lofty adjective. 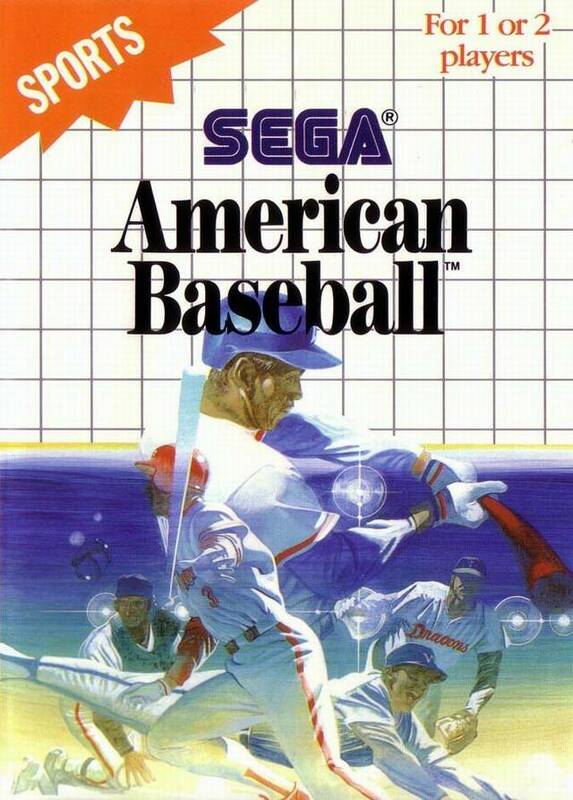 The fantastic interface coupled with smooth gameplay makes for one of the best 8-bit base-ballers of all time. 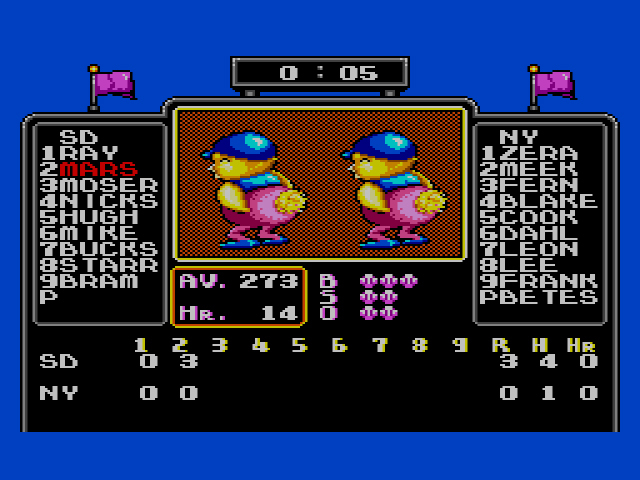 I found this game thoroughly “meh” (it’s not on my SD card for my Mega Everdrive), but it does deserve some credit for simulating the ’87 season, right down to the manager portraits (they all resemble the then-current managers) and even using the final standings for the team select screen. The names are obviously fake, but I’m not sure about the stats. The manager portraits are downright terrifying. Sega took some liberties with their faces, I hope. This is a great baseball game for its time. Some of the innovations in this game were the next batter standing in the batters box, relief pitcher warming up on the sideline and the ability to jump to catch the ball and rob batters of home runs. I played this game a ton as a kid and loved it. Reggie Jacksom actually was a huge SF Bay Area star. Hall of famer. Most of Segas sports stars they signed had Bay Area or CA connections like Tommy Lasorda or Joe Montana. (Well I guess not Walter Payton) but he was already washed up and not his all star self when they made the game. Kind of like Arnold Palmer for the Genesis golf game. If they really wanted someone hot at the time,mthey would have got Jose Canseco to endorse the game. Even though Reggie Jackson is more of a legend than he will ever be.